issues of impartiality giving raise to challenges, including the membership of other tribunals, the conduct of the arbitration and the failure to disclose. In light of the continuing growth of international business and the manner in which it is conducted, this book will be of immeasurable practical value to parties in both business and government, as well as to international law firms and the arbitral community. As a detailed guide to evolving best practice and the general obligation to arbitrate in good faith, it has no peers. Chapter 2 . Making a Challenge. Chapter 3. The Timing of a Challenge. Chapter 5. Standard for Disqualification. Chapter 6. Challenge and Disqualification on the Ground of Independence Issues. Chapter 7. Challenge and Disqualification on the Ground of Impartiality Issues. Annex 1: Table of ICSID Challenge Decisions. Annex 2: Extracts from the Legislative History of the ICSID Convention. "The book is undeniably well-researched, with cases from 10 different jurisdictions, at least four different arbitral institutions, and analysis of decisions from as recently as September 2011. His text and footnotes are relevant and concise. The book also provides several informative annexes and indexes, which will undoubtedly be useful springboards for students or practitioners looking for more information. In a recent teaser article in GAR, Daele noted that challenges under the ICSID Arbitration Rules have statistically had about a 2.6 per cent chance of being upheld. In contrast, challenges under the UNCITRAL Rules have led to approximately 43 per cent of challenges in the last 20 years being upheld. The SCC rules, which have the same disqualification standard as the UNCITRAL Rules, yield similar statistics, with around 30 to 40 per cent of challenges being upheld. This kind of information is essential for both practitioners and arbitrators, appointed and challenged, to consider. If current trends continue, a practitioner’s likelihood of facing an arbitrator challenge in some capacity is only set to increase. This book, a clear and thorough treatment of the subject, will be an important tool for years to come. His readers should be grateful for Daele's stamina in the face of long nights (as described in his preface) "surrounded by malaria-infested mosquitoes". "A necessary resource for counsel and arbitrators alike. As Jan Paulsson describes in the Foreword, this comprehensive resource ‘fills a surprising void’. (xix). Daele has provided the first in-depth comparative law analysis of the challenge and disqualification of arbitrators under ICSID, the UNCITRAL Rules, the ICC Rules, the LCIA Rules, the SCC Rules, and the IBA Guidelines, with an emphasis on ICSID practice. He walks the reader through, chapter-by-chapter, all aspects of the challenge and disqualification of arbitrators, from the requirement of disclosure to how and when to make a challenge to the standard for disqualification. Daele’s insightful analysis and relevant case law, including ICSID challenge decisions, the LCIA challenge digests (27(3) Arb. Intl. (2011)), institutional challenge abstracts, and challenge decisions from national courts, are generously sprinkled throughout." "The ICSID Secretariat recently reported that a record number thirty-eight ICSID cases were registered in 2011. 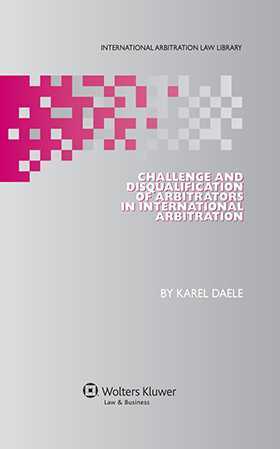 In light of the continuing growth of international arbitration, in particular ICSID arbitration, and the frequency of arbitrator challenges, this book will be of immeasurable value to both practitioners and arbitrators. Indeed, Daele’s comprehensive research and critical observations make this book, in the words of Jan Paulsson, ‘destined to become a familiar reference work’."